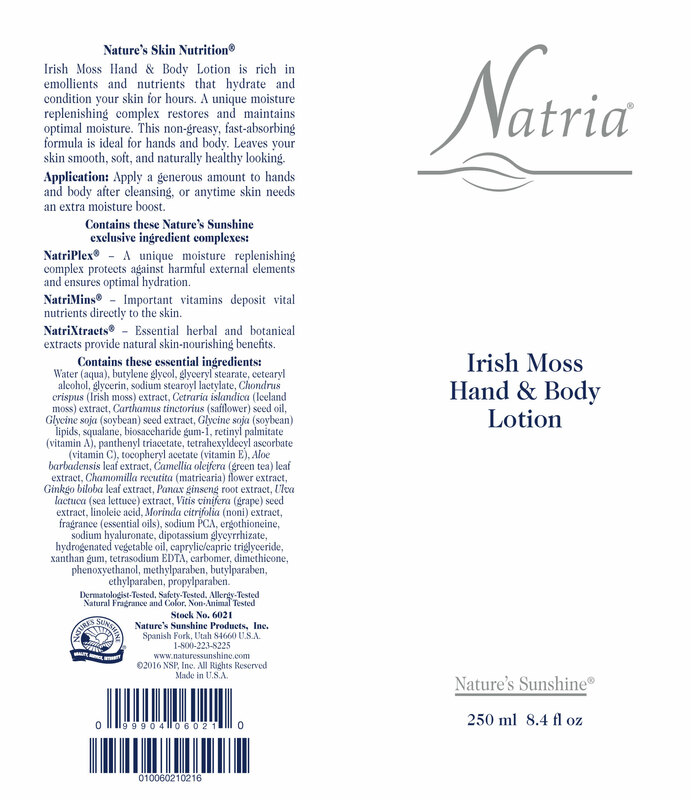 Nature’s Sunshine Natria Irish Moss Hand & Body Lotion supports overall skin health. Packed with the vitamins A, B, C, and E and herbal extracts, this formula nourishes the skin and promotes a healthy skin appearance. 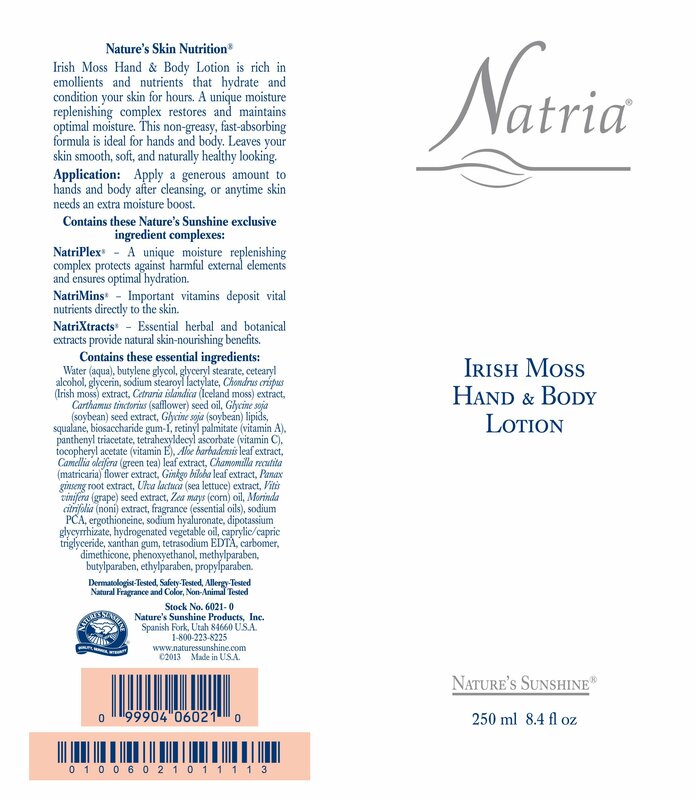 Natria Irish Moss Hand & Body Lotion moisturizes and softens the skin, smoothing out rough patches. It helps protect the skin from drying elements in the environment. The easy-to-use tube makes for simple dispensing. Generously apply to hands and body. Natria Irish Moss Hand & Body Lotion works best when used in conjunction with Natria Moisture Full Body Wash. Instructions: Apply a generous amount to hands and body after cleansing, or anytime skin needs an extra moisture boost. Water (aqua), butylene glycol, glyceryl stearate, cetearyl alcohol, glycerin, sodium stearoyl lactylate, Chondrus crispus (Irish moss) extract, Cetraria islandica (Iceland moss) extract, Carthamus tinctorius (safflower) seed oil, Glycine soja (soybean) seed extract, Glycine soja (soybean) lipids, squalane, biosaccharide gum-1, retinyl palmitate (vitamin A), panthenyl triacetate (vitamin B), tetrahexyldecyl ascorbate (vitamin C), tocopheryl acetate (vitamin E), Aloe barbadensis, Camellia oleifera (green tea) leaf extract, Chamomilla recutita (matricaria) flower extract, Ginkgo biloba leaf extract, Panax ginseng root extract, Ulva lactuca (sea lettuce) extract, Vitis vinifera (grape) seed extract, Zea mays (corn) oil, Morinda citrifolia (noni) extract, fragrance (essential oils), sodium PCA, ergothioneine, sodium hyaluronate, dipotassium glycyrrhizate, hydrogenated vegetable oil, caprylic/capric triglyceride, xanthan gum, tetrasodium EDTA, carbomer, dimethicone, phenoxyethanol, methylparaben, butylparaben, ethylparaben, propylparaben. NatriPlex- A unique moisture replenishing complex protects against harmful external elements and ensures optimal hydration. NatriMins - Important vitamins deposit vital nutrients directly to the skin. NatriXtracts - Essential herbal and botanical extracts provide natural skin-nourishing benefits.